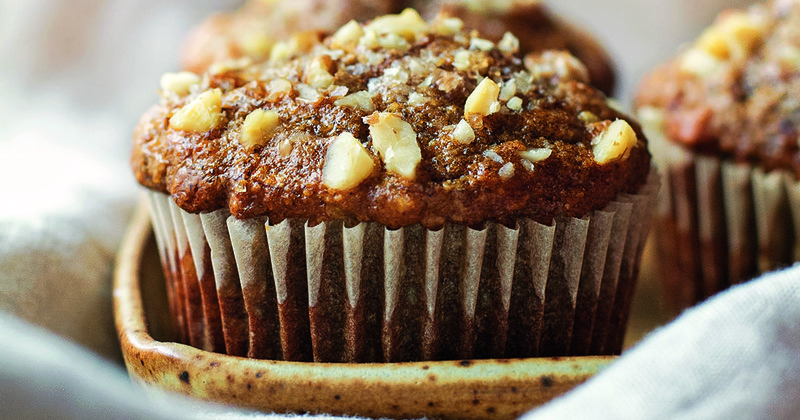 You'll love these banana walnut muffins with no gluten, no dairy, and no refined sugar. Preheat your oven to 350°F (177°C) and prepare a muffin pan by lining the cavities with parchment paper liners. Set aside. Add the oats, ground flaxseed, cinnamon, nutmeg, baking powder, baking soda, and salt to a high-speed blender, and process on high for about 10 seconds or until the oats have broken down into the consistency of a fine flour. Add all of the remaining ingredients except for the bananas and walnuts, and process on high for about 30 seconds or until the batter becomes smooth and creamy. Periodically stop and scrape down the sides of your blender, if necessary. Finally, fold in the mashed bananas and walnuts by hand. Spoon the batter into the prepared muffin cups, filling each one about 3/4 of the way full. Sprinkle the tops with additional walnut pieces, if desired. Bake for 18 to 20 minutes, until the tops of your muffins begin to turn golden brown and a toothpick inserted into the center comes out clean. Allow the muffins to cool in the pan for 10 minutes before transferring them to a wire rack to cool completely. As soon as they've cooled, transfer them to an airtight container and store them at room temperature for up to 5 days, or freeze for up to 3 months.